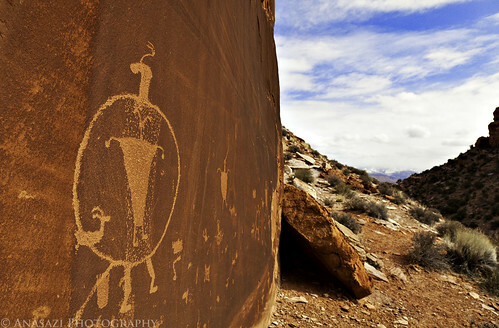 There is a reason I am posting this photo of a large petroglyph near Moab right after posting the Quail Panel earlier. It’s because this petroglyph strongly resembles the ‘shield’ figures found in the Quail Panel over 80 miles away…only much larger! Go ahead and compare! Of course, this one is much larger and pecked instead of painted, but the resemblance is uncanny. This large shield-like figure also has a smaller anthropomorph and part of a bighorn sheep inside of it. While there are quite a few other petroglyph panels found near this one, this one stands out the most for it’s uniqueness.